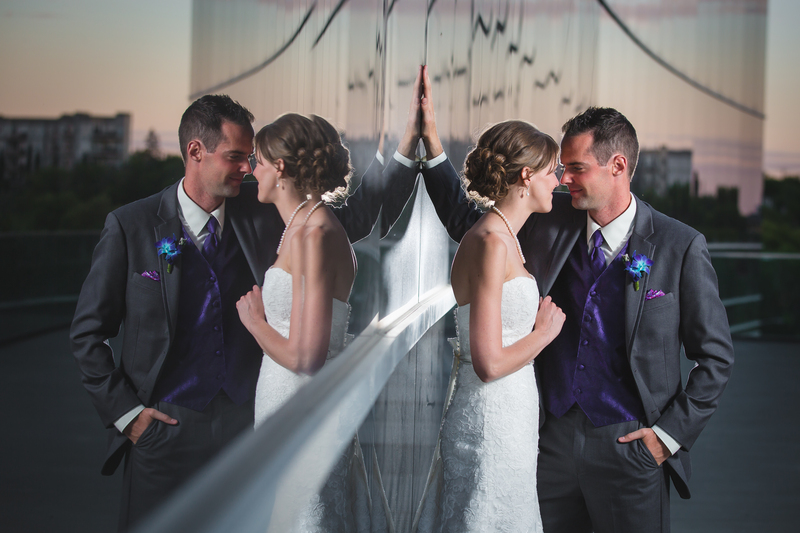 Alyssa & David could not have asked for a more perfect day for their wedding in Sherwood Park and Edmonton. The weather was perfect – not too hot and not too cold with just a few clouds and enough of a breeze to keep the mosquitoes at bay. We started the day at Alyssa’s parents house in Sherwood Park where Alyssa was getting ready. Once she put on her dress, we headed outside to their backyard where she finished getting into her dress and her parents helped her with her jewellery. At one point, everyone was looking at Bruce a little strange and detected a strange odour. Turns out Bruce had found the one spot where their dog Bear had done his business so we joked that he literally stepped in bear poop. Thankfully it was Bruce who stepped in it and not Alyssa with her dress. OnceÂ Alyssa was ready, we headed over to Mount Olivet Lutheran Church for their ceremony. Pastor BruceÂ conducted a lightheartedÂ ceremony that included some entertaining gifts & marriage advice for the lucky couple. After their ceremony, we headed to nearby Smeltzer House for family photographs before heading over the U of A for formal photographs with the bridal party. After photographing some of the formals, we stopped off at Henrietta Louise Edwards ParkÂ to grab a few more photographs of the happy couple before heading over to the Shaw Conference Centre for their reception and we were treated to some gorgeous mid-afternoon Alberta sunshine. Once we were finished at the park, we made our way across the river to the Shaw Conference Centre for Alyssa & David’s reception in the Riverfront Room to round out the day. Thanks again for choosing us to Â be your wedding photographers. Enjoy this sneak peek from your day and we can’t wait to share the rest of your images with you when you’re back from your honeymoon!